Thousands of years in the making, the culture of Papua New Guinea is unique and untouched. In the remote villages visitors will find tribes that passionately maintain traditions through art, initiations and Sing Sings. A Sing Sing expressing customary dance, music and traditional costume provides the opportunity for visitors to witness tribal traditions in an explosion of color and sound. 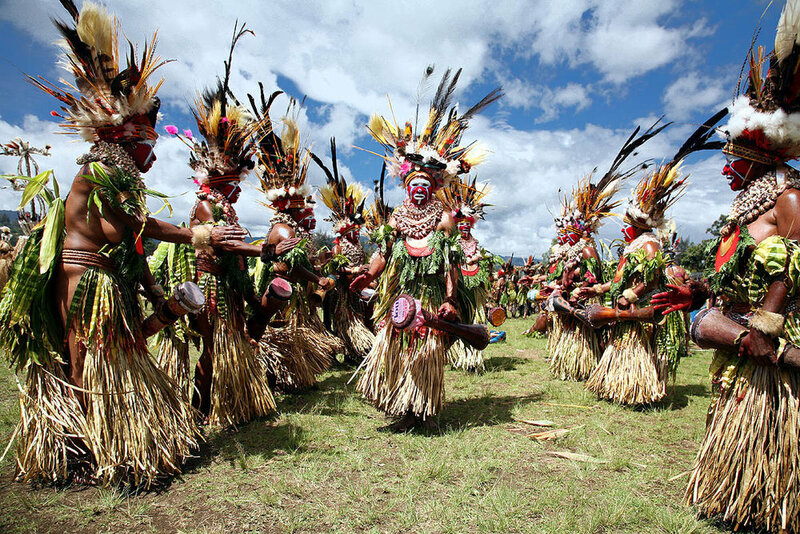 On Independence Day (September 16), over 100 tribes across Papua New Guinea gather at Goroka in the Eastern Highlands for a celebration of their cultural diversity. Only a couple of hundred foreigners attended this spectacular and unique event, and you should be one of them. This Acanela Expedition © is an adventure with unique cultural interactions in primitive villages with basic accommodations and facilities. Embark on this small group exploration prepared to have many hands-on encounters with local peoples and cultures, all while experiencing all the historical & culinary highlights along the way. Travel to the mudmen’s village on the Asaro River witnessing their slow movements, grotesque masks, and clicking bamboo claws as they dance through the bushes and smoke of several strategically placed fires. Day 11 (Monday) Wewak / Port Mosby: Awaking well before dawn, we will prepare to catch our early morning flight from Wewak to Port Mosby, where we will connect with our international flights back home. Breakfast will be packed and taken with us on the airlines.